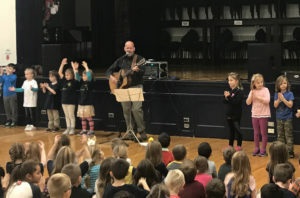 Donald P. Sutherland Elementary School hosted guest musician Brian Chevalier recently for DPS Stands Up to Bullying Day. Mr. Chevalier played songs for students that promoted positive character and how to be a good friend. The students, and staff, participated by singing along and dancing.